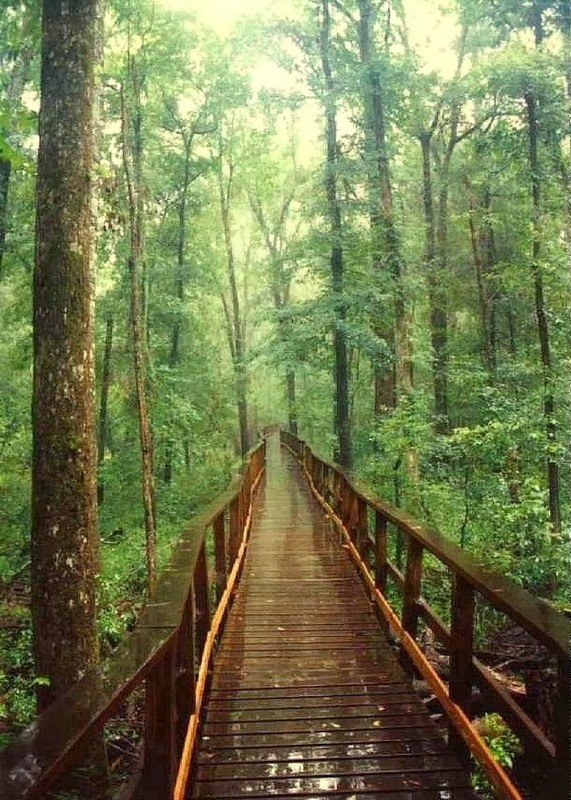 Congaree National Park preserves the largest tract of old growth bottomland hardwood forest left in the United States. Located in South Carolina, the 26,546-acre (107.43 km2; 41.48 sq mi) national park received that designation in 2003 as the culmination of a grassroots campaign which had started in 1969. The lush trees growing in this floodplain forest are some of the tallest in the Eastern U.S., forming one of the highest temperate deciduous forest canopies remaining in the world. The Congaree River flows through the park. About 57 percent (15,000 acres or 61 square kilometers) of the park is designated wilderness area. Most visitors to the park walk along the Boardwalk Loop, an elevated 2.4-mile (3.9 km) walkway through the swampy environment that protects delicate fungi and plant life at ground level. Canoe rides through the swamp are conducted for free Saturday and Sunday as staffing permits. Congaree boasts both the tallest (169 ft, 51.4m) and largest (42 cubic meters) Loblolly Pines (Pinus taeda) alive today.